i am an artist but i can seem to make up a good enough story for a manga. i want it to be funny of course but im not sure if i should take the action route or the romance route or to compile something else. my specialty is drawing people though so im not that exp. with drawing cars, mecha, etc so i could use artists in that area too. i dont know its always been my dream to have my own manga and tokyopop always has contests to send your work in but i need help!! everytime the deadline for it passes me by and i never even get to starting anything but this time i really want to do something!! the story doesnt have to be straight out christian but i want it to have an underlying christian theme. this is a big task but im willing to do it if people are willing to do it also. maybe ill send in some of my drawings so everyone can see how i draw and can decide if they want to work with me or not. i hope this will be my chance to finally get something started. i still have to buy all the materials though. so if anyone is interested pleez tell me. maybe just shoot off some ideas that you would have if you had your own manga. im open minded. i will write a story but i am 11 so u might not want me and it has been my dream to have a manga thing if u want me tell me i love to write manga type stuff like what kind of place do u want the story to be taken in??? ?pm me if i can write of your manga thing thanks!!!! "To Protect, To Serve, To Anime!" What do u want it to be like??? 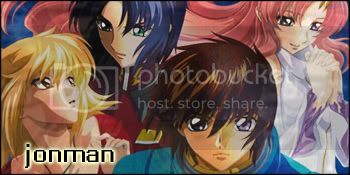 ?like gundam seed or trign what kind of anime do u want it to be like ? I think at this point it would be best for jonman to be allowed to write, if you will have him. Young people need projects to exercise their abilities. But if it was a short term issue, I would be happy to work on a story. This is assuming that jonman ceases to want to help or something of the sort. Heh. I entered that contest in May. >> Didn't win, but I had fun. If I ever get any free floating ideas, I'll be sure to share them. He is God / In His purpose / I will stand / I've been renewed by Him alone / We've been made by the Maker / Bought by the Buyer Broken / by the Breaker / I am His.